(30.04) No.1215 – György Bakcsi & Zoltán Laborczi (s=5; Black Must Capture). Приветствие обоим авторам в разделе Оригинальных задач JF! (26.04) No.1214 – Paul Rãican (phser-=82). (26.04) No.1213 – Сергей Шумейко (ser-h#6 ; Circe). Приветствие Сергею в разделе Оригинальных задач JF! (26.04) No.1212 – Peter Harris (hs#3 ; Nightrider ; Sentinels, Transmuted Kings, Anti-Circe, Isardam). Dedicated to Dirk Borst. Питер упоминает, что Probleemblad опубликовал множество его задач, но в данном случае он посвящает задачу Дирку в знак признательности за согласие судить Ретро конкурс JF. Все ранее опубликованные задачи Вы можете увидеть в подразделах верхнего меню Оригинальные задачи. Судья сказочного конкурса JF-2017(I) еще не назначен. Судья конкурса Retro & PG задач 2017-2018: Dirk Borst. Composing Tourneys announced for the 12th Belgrade Problem Chess Festival 26th-28th May 2017 are split into 3 groups, including fairy Group C (HS#2.5 Max) which will be judged by solvers and composers themselves, in a special Composing-Solving-Judging contest on May 26th 2017, the first day of the Festival. 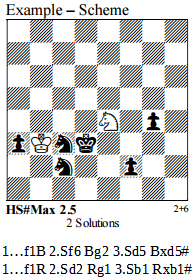 Group C – HS# Max 2.5, 2 Solutions Thematic condition: Help-selfmate Max is a new condition, with the help-play before the last two half-moves, presenting S#1 Maximummer (Black has to play the geometrically longest move). The BIT 2017 will use the method of entering originals for the tourney directly to the Mat Plus website. Composers unable to use it may send their entries by email to the Mat Plus administrator: borislav.gadjanski@gmail.com. Deadline: May 23rd 2017. (22.04) No.1184.1 – Paul Rãican (-8 & s#1 Proca Retractor; Anti-Circe). Улучшенная версия к No.1184. (17.04) No.1210 – Борис Шорохов & Дмитрий Туревский (h#5.5 ; Relegation Chess). (16.04) No.1201.1 – Andrew Buchanan (h=3; C- ?). Улучшенная версия к No.1201. 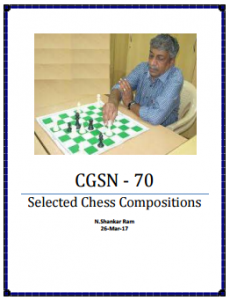 This e-booklet is a small tribute to CGSN, to celebrate his 70th birthday, which was on 24-Mar-2017. The 70 compositions included here form approximately 25% of his total oeuvre. I hope my selection captures his best and delights all readers. (16.04) No.1209 – Claude Beaubestre (h#4 ; Einstein Chess, Equipollents Circe). (15.04) No.1208 – Peter Harris (hs#2 ; Sentinels, Super-Circe, Anti-Andernach, Isardam). (14.04) No.1207 – Michael Grushko (ser-h#8 ; Phantom Chess, Ghost Chess). (14.04) No.1206 – Ladislav Packa (h=2 ; Anti-Circe). (14.04) No.1205 – Петко А. Петков (s#6 vv ; Immun Chess). (12.04) No.1204 – Kenneth Solja (h#4.5* ; KoeKo White Maximummer). (10.04) No.1203 – Игорь Кочулов (hs#3.5 ; LEO, PAO, VAO, NAO). 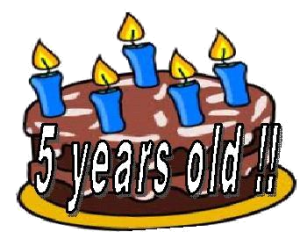 It feels like so recently I proudly wrote about JF’s first year, but today this website celebrates the first real jubilee, 5 years.. and I don’t know where to start from..
You know, I’m really sorry about any delayed publication. In the same time I’m deeply grateful to the authors who save a lot of my time sending me their problems carefully prepared for publication, helping me even to do the animation faster. They know who they are, but I would like to mention at least some names: Vitaly Medintsev, Václav Kotěšovec, Aleksey Oganesjan, Karol Mlynka… Publication of one problem can take me from 15 minutes to several hours. When I receive initial position and the condition in a clear English notation (complete Popeye notation even better), including solutions with departure and arrival squares (especially for the problems impossible to be tested at all, or tested with Popeye) it is a huge help to prepare the publication with animation. I wrote about the numbers of published problems and tournaments held. It would never happen without JF’s judges, accepting that hard work. You can see all the names in the sections of original problems, but I’d like to thank once again to those who have finished their awards: N.Shankar Ram, Juraj Brabec, Hans Gruber, Eric Huber, Vlaicu Crişan, Dmitri Turevski, Kjell Widlert, Ofer Comay, Franz Pachl and Petko Petkov, the judge of 4 thematic tournaments. The last but not least, I would like to thank those composers who don’t use the JF to publish their composition the same day it was composed… Even after waiting some days to make sure they came to the optimal positions, they would publish their renderings faster than in printed magazines, and would avoid sending corrections and new versions when problems were already published. As for the editor, she will always be more impressed by the quality than by the quantity of published compositions! Running the site, publishing different kinds of fairy problems, and announcements, I feel like learning all the time. But getting to know all of you who help me, who contribute to JF, who are part of “JF’s community”, means even more! The names, so many, from so different countries, turned into alive persons. And I know, this is in the both directions. Some years ago (2, 3?) I started seeing the references to Julia’s Fairies publications as simply: JF… The independent life of these two letters still means a lot to me.